A great many amateur jugglers have in vain tried to emulate the great Paul Cinquevalli in his inimitable balance of two billiard balls, which defying the laws of gravity, rest upon one another with ease, and even consent to balance upon an ordinary billiard cue, which in turn is balanced upon the Cinquevallian chin. Here is a way in which the effect may be achieved, if not with ease, still without much juggling. 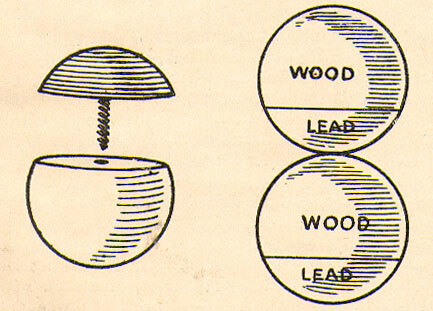 The balls used are of wood at least two thirds of them the other third being of lead. This arrangement naturally keeps the centre of gravity in one place. The balance is still further assisted by a small dent in the exact centre of the leaden part, which enables adjustment to be easily effected. The method of balancing is as follows :— The upper ball is balanced dented side down upon ball No. 2, this is rested and balanced upon the tip of the cue, which rests in the dent of ball No. 2. With this arrangement the “ balance ” is a matter of ordinary care, and is not more difficult than the art of balancing a billiard cue.